Q: “I need a tool which can help me convert my files into MKV format and AC3 6 channel audio the video bit rate is 9800 Kbps, I watch them with the VLC player on my Home Cinema system PC-TV on my 50 inch TV. I store Blu-ray/DVD on my 4TB NAS and watch them when I want. I heard about you from a recommendation on an amazon.co.uk BD player review and It’s very good and I use it to rip DVDs and BDs.” Hold on reading and get the best solutions. To preserve multi-track audio, copying Blu-ray/DVD to MKV is the top consideration for the compatibility and excellent video quality of MKV for Home Cinema System PC-TV via VLC. Backing up Blu-ray/DVD to MKV can keep AC3 DTS 6 channels, which give you a whole lot better in the realm of audio. This article will guide you through the process of backup of your Blu-ray/DVD discs using the MKV container, including 5.1 audio and subtitles. Comparing to AC3, DTS, its coding method sounds better due to higher bit rates and less compression. 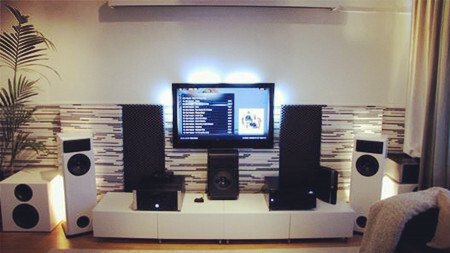 And with DTS format, you also can get 6 audio channels of Blu-ray/DVD discs. So if you want to get great sound for Blu-ray/DVD movies, copying Blu-ray/DVD to MKV with AC3 DTS 6 channels is the best choice. While you consider which programme can help do a lossless Blu-ray/DVD to MKV with AC3 DTS 6 channels backup, I recommend Pavtube ByteCopy. This software does great job to make 1:1 copy of Blu-ray/DVD disc to MKV with AC3 and DTS 6 channels, original video quality, chapter markers and multiple subtitle tracks preserved. When copying Blu-ray/DVD to MKV, it can give you 6X fast speed with GPU acceleration. It also can offer you the full preservation of Dolby TrueHD, DTS-MA, PCM 7.1 channels. If your media player doesn’t support 7.1 channel, ByteCopy can help you rip Blu-ray/DVD into AC3 DTS 6 Channels 5.1 sound. When you prepare to copy Blu-ray/DVD to MKV with AC3 DTS 6 channels, ByteCopy can give you two solutions: solution A: copy Blu-ray/DVD to MKV with original AC3 DTS 6 Channels; solution B: encode HD audio (Dolby TrueHD, DTS-MA, LPCM) to AC3 6 Channels audio. Select optimized video format for output. 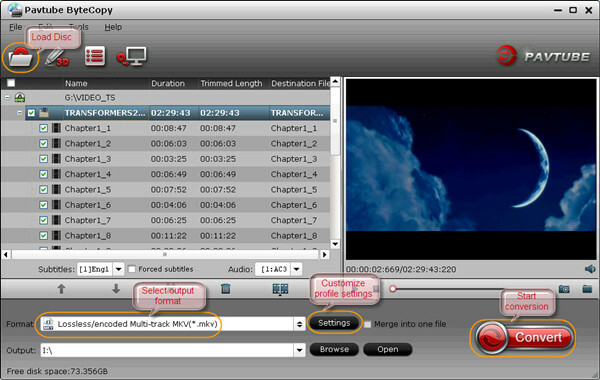 In order to preserve AC3 DTS 6 Channels audio in MKV file, you are suggested to choose “Multi-track Video > Lossless/encoded Multi-track MKV(*.MKV)” as output format. For AC3 and DTS 5.1 audio in source Blu-ray/DVD disc, no need to encode these audios, so just use the default ausio settings, and start conversion. You are able to copy Blu-ray/DVD to MKV with AC3 DTS 6 Channels. Step 1: Load Blu-ray/DVD disc into the app. Step 2: Select “Multi-track Video > Lossless/encoded Multi-track MKV(*.MKV)” as output format. When you Blu-ray/DVD discs contain HD audio such as Dolby TrueHD, DTS-MA, LPCM, go to profile settings, switch to Audio tab, enable “Encode” option and set up audio codec to AC3. Then you can copy Blu-ray/DVD to MKV with AC3 6 Channels. Note: If you just want audio, ByteCopy can extract WAV/FLAC audio from Blu-ray/DVD discs and you even can only extract SRT subtitles from Blu-ray/DVD disc. Now, you would get AC3 DTS 6 Channels audio in MKV file ripped from Blu-ray/DVD discs for Home Cinema System PC-TV via VLC. You can enjoy high quality audio experience or switch the audio track optionally as you like.